This elegant villa complex is located in Oia and offers cave-style accommodation, one with panoramic views of the caldera, the sea and the volcano. Please inform Onar Villas in advance of your expected arrival time. For this, you can use the special requests section when making the reservation or contact the accommodation directly. The contact details appear on the booking confirmation. Suite with high ceiling and bedroom with large living room. It has a nice porch with a private outdoor hot tub and a marble bathroom. Suite with a lovely bedroom overlooking the sea, a small lounge with a sofa and a marble bathroom. It has a private hot tub for 3 people. The hot tub is located a few steps from the Jasmin Suite, on a private terrace. Suite with bedroom, small living room, bathroom with shower located in an old oven and 2 chimneys. It has a private hot tub for 3 people. 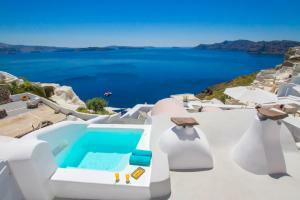 Suite with 2 bedrooms, private outdoor hot tub and views of the caldera and nearby islands. Cave-style room with a balcony with a private outdoor hot tub and views of the sea, the caldera and the volcano. The self-catering Camellia Villa is located less than a minute's walk from the Onar Villas reception. It is located on the 1ª and last floors of a house located on the main street that leads to Oia. This accommodation offers everything necessary for the stay of a family with children. The accommodations of this type are not cave houses.